Dexter Daily: Cast and Producers Talk Series Finale: "Dexter's Not Likely to Walk off Into the Sunset"
Cast and Producers Talk Series Finale: "Dexter's Not Likely to Walk off Into the Sunset"
via IGN: After eight seasons, Dexter comes to a close. And long-time viewers are wondering, first and foremost, if things will end, well, happily, for Dexter. There's also been a lot of buzz about a potential spinoff series, but Showtime has been slow to pull the trigger, as it were, on that decision. IGN had the chance to chat with star Michael C. Hall, executive producers Scott Buck and Sara Colleton, as well as co-stars David Zayas, C.S. Lee, and James Remar, and president of entertainment at Showtime David Nevins about what we can expect from the finale, to spinoff or not to spinoff, and Dexter's legacy as the first of this contemporary wave of serial killer protagonists on television. Dexter's End: "Happily Ever Murder?" People will be watching Dexter's end very closely, first an foremost as fans, but also because we'll want to see if television has shifted so much that we will actually see a fairy-tale end for our Bay Harbor Butcher. "I think I would not be happy sending a serial killer walking happily off into the sunset," Buck said of the ultimate conclusion for this character. "Because it's not true. I don't think that ever happens with serial killers, and even though our show is not necessarily reality, it's sort of hyper-reality, I'm still very careful about the message that we're sending out." "I love Dexter," Colleton, who has been with the show since the beginning, countered. "I don't want to see him punished." Read more after the jump! "I don't think the show has ever definitively deemed Dexter a hero or a villain and has left it to the audience to debate," Hall said of the sort of ethical, or "moral of the story" element that is inherent in how the writers choose to end this series. "I think it's reasonable to think that the show won't, in the final minutes, give you a definitive answer or out in terms of the nature of his morality." "Dexter's prime directive is don't get caught, don't hurt yourself, don't get in trouble." Remar said when asked if his character would be pleased with Dexter's end. "Harry loves him unconditionally, and he wants him to continue doing what he's doing. When Harry's not pleased with Dexter, it's always when Dexter is doing something self-destructive, so it's hard to say how he would react to the end." "History shows us that people have very different reactions to finales," Lee said of the potential audience response. "I loved the end of The Sopranos, I know a lot of people didn't. 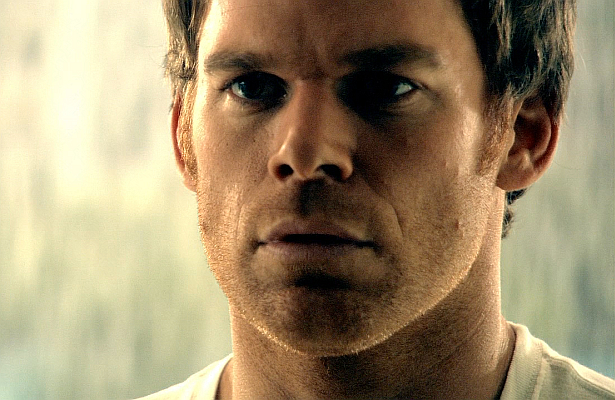 I know that however it goes down with Dexter, it's going to be big, and the end of a great series." "Some people will question it," Zayas added. "But after awhile, they'll figure out that this is the way it needed to end." Does Dexter Deserve His Own Table? "I said an off the cuff remark at the first TCA (Television Critics Association) press tour panel for Dexter," Colleton reflected. "I said that as he starts to piece together bits of his humanity, he's going to start to understand his responsibility as a fully sentient human being. So the question, 'Does he deserve his own table?' has always been there behind the whole series." When we spoke with Hall, we asked: If he were really operating by the code, after what happened with LaGuerta in particular, how would Dexter deal with himself? "That's a good question," Hall said. "I think that if Dexter encountered himself he would first of all feel like he was looking in the mirror, but that's a really interesting question. I wonder if Dexter would be able to legitimately decide that the Dexter he was looking at deserved his table, given that more than one innocent person had died, if not at his hands, then because of him." I suppose that's a question that the series may answer this Sunday. Or, perhaps it's left for us to decide for ourselves. "I think a fantasy that he can be rehabilitated or let go of the dark passenger, or his compulsion to kill, is something that comes up for Dexter periodically," Hall said of the hope that his character may just hang up the knives, as it were, and decide to raise a barrel of gorgeous, if sociopathic, rugrats with Hannah. "It's something he entertains and something he in greater or lesser degrees believes in, but things up to this point have suggested that it's not a possibility. But some hope remains. I think that some hope remains now as we move into these final episodes." In a way, this series, which has followed this man's journey to understand who he is, and where he comes from, through the lens of the birth and adoptive family that created him, is now taking Dexter on a very natural maturation process. One in which you let go of your primary family, and prioritize the one you've chosen. In Dexter's case, that means yes, choosing Hannah and Harrison over Dr. Vogel (the mom figure), Deb, and even Harry's code. "He's never going to let go of Deb," Colleton said. "But he's at this point that the pull of the dark passenger is no longer there and there is something else that he wants. But as we saw, the hesitation that comes with very normal human questions of, "Should I stay or should I go?" with Dexter, that one moment of hesitation brought ruin. Dr. Vogel is now dead and the killer is on the loose. No matter what Dexter does, he still can't outrun his passenger." "It's interesting, this has always been a show about Dexter growing up," Buck said. "Even though when we meet him he's an adult, there's a very childlike side to him, so we really have watched him grow up. This is the season where he steps away and becomes his own man - and part of that is accepting responsibility for who you are and what you've done." Will he, in taking responsibility, need to once and for all confess what he's done? Or will fate find another way to mete out punishment? Spinoff: Half-Hour Comedy, The Masukas? There has been a lot of speculation on the potential spinoff for this series. Would it be a standard cop show focusing on the team of detectives that we've come to know? Would it follow another killer? Focus on Deb? For her part, Colleton stresses that they feel that they have created a complete series and that the finale will indeed mark "the end." The rumors persist, however, and Showtime has not ruled a spinoff series out. Lee joked that it would be a half-hour comedy in which he and Deb get married, and raise his new daughter. Meet the Masukas! They're just like you in that they're not like anyone else! "I mean I imagine it would have something to do with Miami Metro," the actor pondered, thinking of a slightly more realistic possibility. "Or it could very well be Deb." For her part, Jennifer Carpenter has insisted that she has played Deb, "from start to finish," and is now well and truly done. "If it's not about Angel," Zayas joked, "It would be interesting to see what happens with Hannah and Harrison. Every character is important, though, so it's hard to say which would be best." It's possible that Showtime already has something in the works, but would rather not announce prior to the finale. On the other hand, everyone could die in the end! Only Sunday will tell. "I don't think of Dexter as a serial killer show," Colleton mused, reflecting on the impact that her series has had on our current television culture. "Yes that's a big element, but it's about bringing up moral issues, and using Dexter as a way to look at our own human nature." For Remar, the show was saying, "It doesn't really matter what side you're on so long as you believe you're right. Fathers have sent their sons off to war since the beginning of time, and the killing is fine, provided that they follow the father's rules, and the father determines who the enemy is." So that's one way to look at it. "I think the final lesson of the series is that If you follow the mind of someone, not that you'll condone their actions, but you'll understand the steps they had to take to do what they had to do," Zayas said. On a pragmatic level, Nevins feels that the show, "expanded the pallete of what we can do on television. It expanded the kinds of characters we embrace and the kinds of stories we embrace. So, I think that's its legacy."